A new original arcade title: Get Outta My Face! While finding indie developers making arcade titles is a rare occurrence, I’m happy to see that the numbers are growing. We’ve covered Galloping Ghost Productions and their making of Dark Presence; there also was Galactic Front being worked on by a one man team. 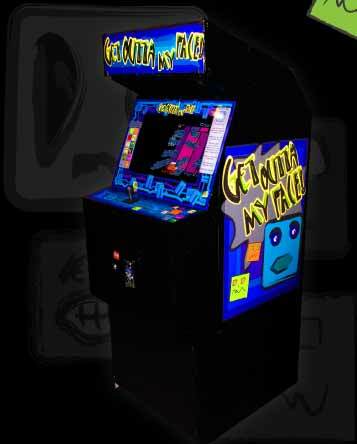 You can add another one man team to that list of indie arcade developers, Will Brierly who has designed an original arcade exclusive title called Get Outta My Face! We are going to try and find out more, including how you can get your hands on this game if you are interested. In the meantime, check out the video of the game in action below. It looks like there are a lot of physics involved and it’s always great to see something hit the arcades that is innovative and follows the eternal rule ‘easy to learn, difficult to master’, which is what made all those games of the early 80’s so great. Stay tuned for more!